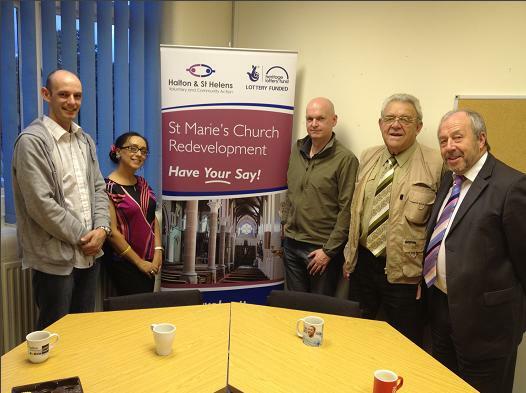 Our brilliant team of VAG volunteers got together at our offices on Monday evening to review the Have Your Say! 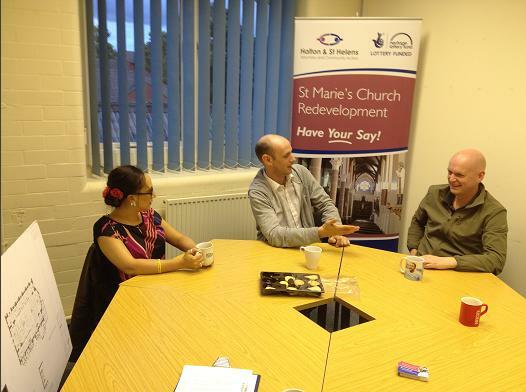 consultation exercise that we’ve been running. 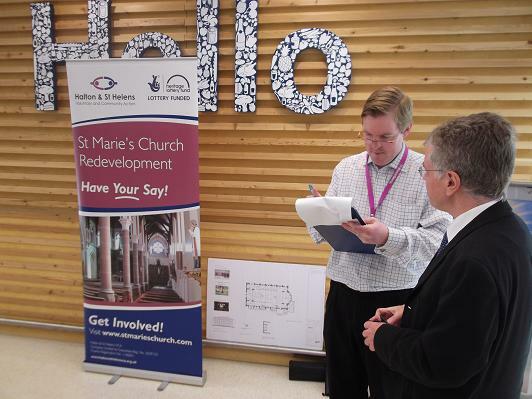 They were anxious to find out if the general public shared their views on what form the heritage displays and activities should take inside a redeveloped St Marie’s. 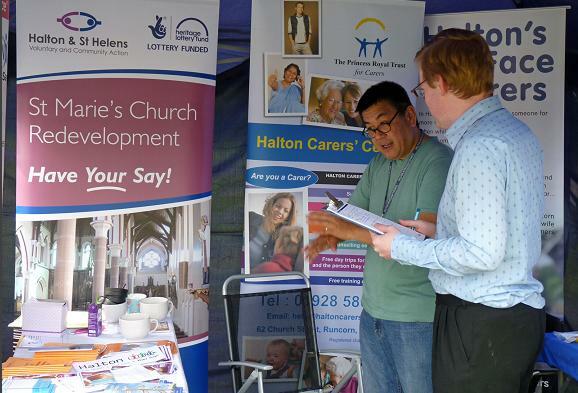 Don’t forget that if you want to Have Your Say, you still can! 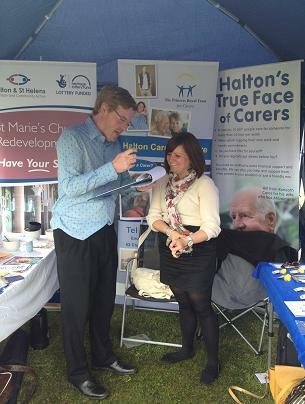 Simply click on this link to visit on our online survey. It will only take a few moments of your time and it could a massive difference to our quest to breathe new life into this beautiful old building. “It’s all about Pugin for me”. Mike reiterates his view on what the number one selling point should be. Hazel looks on with dispair as Pete and Dave get very excited about brass bands. 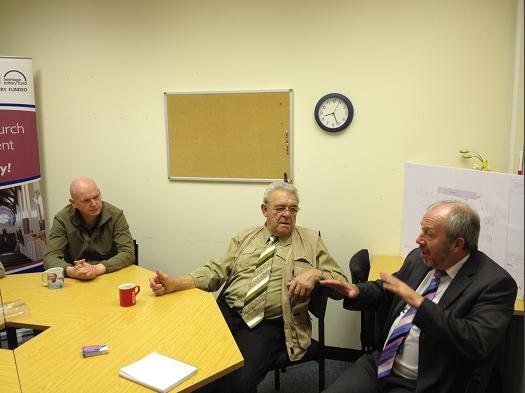 I am very grateful to the guys for giving up their free time on a Monday evening. It is greatly appreciated. 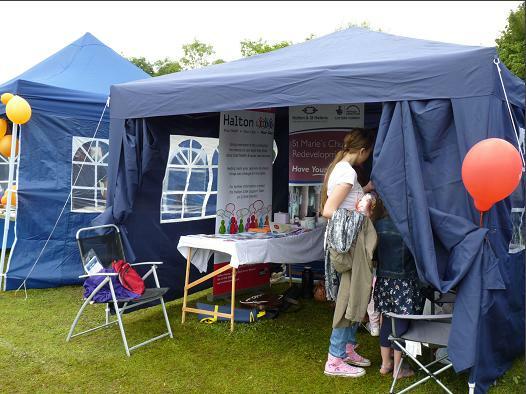 On Friday 3rd August, I joined two fine organisations (the Halton LINk and Halton Carer’s Centre) in the token Voluntary Sector Tent at Halton’s famous “Party in the Park” event in Phoenix Park in Castlefields. 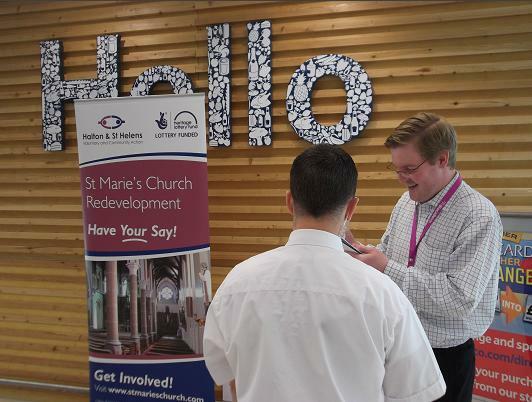 It was a brilliant afternoon and I enjoyed the chance to meet with local residents and show them our plans for the proposed redevelopment of St Marie’s. The responses we collected were very positive. 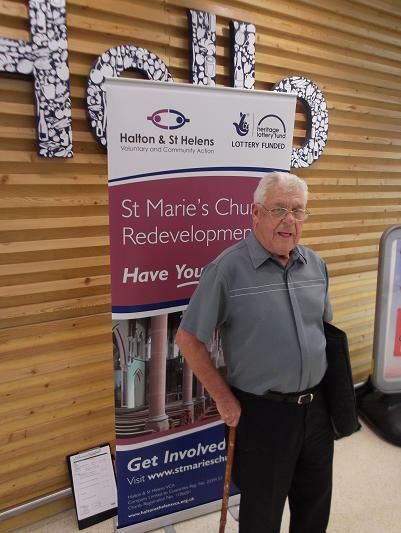 On Thursday 2nd August, I was joined by David Waterfall (from Pulse Regeneration) as we set up camp in the new (extraordinarly large) Tesco in Widnes. 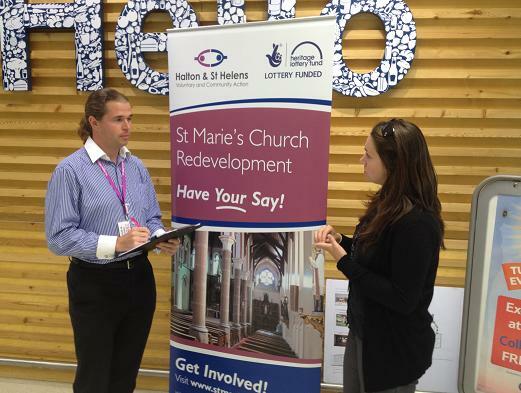 We had a great day chatting to shoppers about the proposed redevelopment of St Marie’s Church (which is quite literally next door to Tesco’s). The responses we collected were (nearly) all positive. A local history buff stops by to talk to me his love of old buildings. 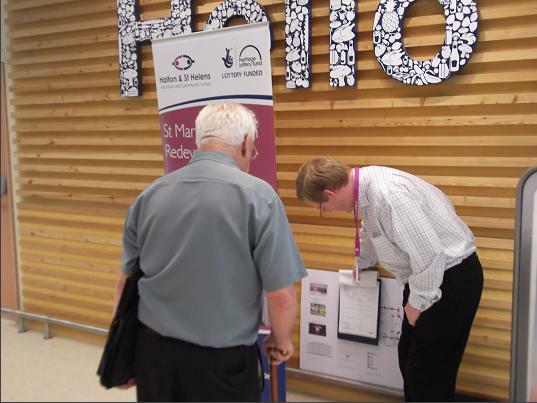 A Tesco staff member (on break) stops by to find out about our plans. 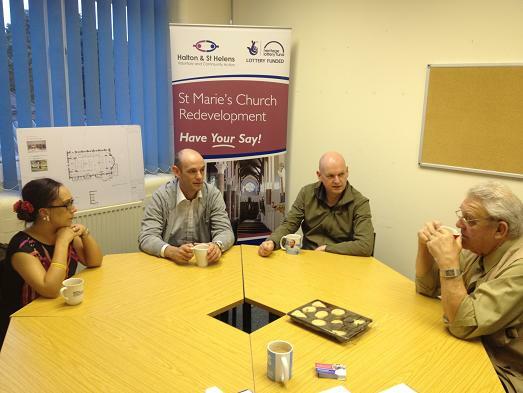 Here’s me explaining how the front third of the church will be restored to it’s former glory. 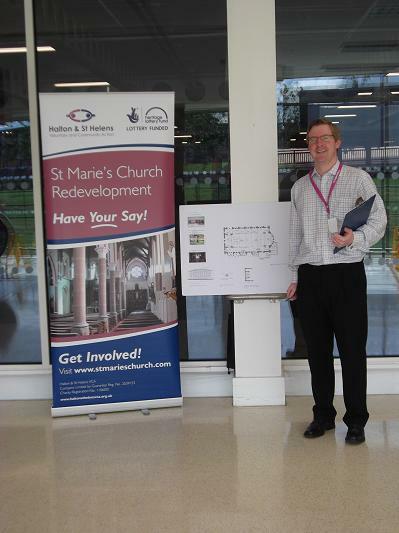 This former parishioner was very pleased with the plans!